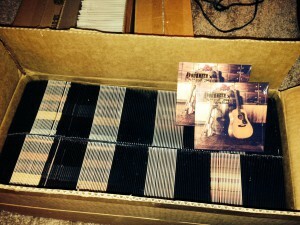 The CDs have arrived. We’re hard at work rehearsing. The room is rented. A mere week remains before our big CD release show on Oct. 19, and we couldn’t be more excited. The final pressing of “Beloved” is impressive in every way, from the gorgeous cover art by Marla Keown to the engineering and mastering work by Tom Payetta and Gannon Kashiwa. We’ve created a truly impressive debut album, and we hope you all feel the same way when you hear it for the first time. To celebrate that occasion, we’ve put together quite a program for Lannie’s Clocktower Cabaret on Oct. 19. We’ve got a killer setlist finalized, amazing guest musicians booked and about 1,000 CDs to sell. We owe a great deal of thanks to a great many people, a crew of supporters and creative collaborators that includes photographers, singers, web experts and old-fashioned friends and family. We’re sure all the hard work and time is going to pay off, and we can’t wait to share the experience with you. In case you haven’t gotten around to reserving tickets yet, you can do so here. We’re looking forward to celebrating with you all next week! This entry was tagged CD release show. Bookmark the permalink. This was the best live concert I’ve ever been to in my life. So much fun, I can’t believe it’s not regulated somehow. And now this music is going round and round and round — on my CD player AND in my head! !